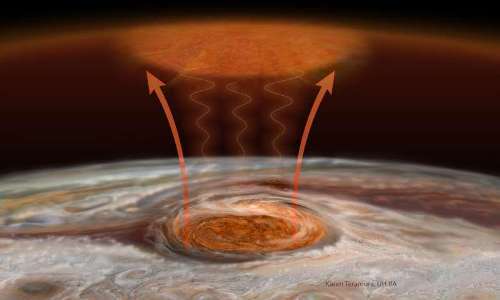 Researchers from Boston University’s (BU) Center for Space Physics report today in Nature that Jupiter’s Great Red Spot may provide the mysterious source of energy required to heat the planet’s upper atmosphere to the unusually high values observed. Sunlight reaching Earth efficiently heats the terrestrial atmosphere at altitudes well above the sur-face—even at 250 miles high, for example, where the International Space Station orbits. Jupiter is over five times more distant from the Sun, and yet its upper atmosphere has temperatures, on av-erage, comparable to those found at Earth. The sources of the non-solar energy responsible for this extra heating have remained elusive to scientists studying processes in the outer solar system. “With solar heating from above ruled out, we designed observations to map the heat distribution over the entire planet in search for any temperature anomalies that might yield clues as to where the energy is coming from,” explained Dr. James O’Donoghue, research scientist at BU, and lead author of the study. Astronomers measure the temperature of a planet by observing the non-visible, infra-red (IR) light it emits. The visible cloud tops we see at Jupiter are about 30 miles above its rim; the IR emissions used by the BU team came from heights about 500 miles higher. When the BU observ-ers looked at their results, they found high altitude temperatures much larger than anticipated whenever their telescope looked at certain latitudes and longitudes in the planet’s southern hemi-sphere. Jupiter’s Great Red Spot (GRS) is one of the marvels of our solar system. Discovered within years of Galileo’s introduction of telescopic astronomy in the 17th Century, its swirling pattern of colorful gases is often called a “perpetual hurricane.” The GRS has varied is size and color over the centuries, spans a distance equal to three earth-diameters, and has winds that take six days to complete one spin. Jupiter itself spins very quickly, completing one revolution in only ten hours. “The Great Red Spot is a terrific source of energy to heat the upper atmosphere at Jupiter, but we had no prior evidence of its actual effects upon observed temperatures at high altitudes,” ex-plained Dr. Luke Moore, a study co-author and research scientist in the Center for Space Physics at BU. Solving an “energy crisis” on a distant planet has implications within our solar system, as well as for planets orbiting other stars. As the BU scientists point out, the unusually high temperatures far above Jupiter’s visible disk is not a unique aspect of our solar system. The dilemma also oc-curs at Saturn, Uranus and Neptune, and probably for all giant exoplanets outside our solar sys-tem.